Tomatoes are very sensitive to cold and rain. They need a space protected from the wind and rain with chalky garden soil rich in humus, and well fertilised. Your need: One person consumes an average of 25 kg a year. Tomatoes come in various sizes, shapes and colours; in red, orange, yellow, green, black and striped. There are old and new varieties of tomatoes. The term F1 identifies newer types of tomato. These are varieties which have been further developed and refined. These old tomatoes which our grandmothers used to grow usually have quite a strong flavour. They are well suited for cultivation out in the open. However, they are not so resistant to late blight or to other tomato diseases. Popular varieties: Micro Cherry, Resi. Resi is a robust tomato which will flourish without any protection in the open. Indeterminate or vining tomatoes, which grow a single stalk which must be supported by a stake. Tomatoes prefer a sunny, warm location protected from wind and rain with chalky garden soil which is rich in humus and heavily fertilised. To obtain seeds, collect the pips from the tomatoes with a small spoon and put them, including the fleshy part, into a glass of water. After about two days the seeds will separate from the slimy casing. Take out the seeds, clean them and then put them onto kitchen paper to dry. Don't use new varieties (marked with F1) of tomato to obtain seeds. This is because the same tomato will not be produced, but it will drop back to its original form. Tomatoes can also be planted on your balcony. One day before sowing put the seeds in lukewarm water to improve germination. Put the seeds in a heated room until they germinate and then move to a less heated room. Water sparingly until they germinate and then more frequently but never sprinkle from above. If the plants are kept relatively dry then the tomatoes will have a harder skin and will have significantly more aroma with a stronger flavour. Make sure that they are protected from rain. Greenhouse film sheeting stretched between stakes is sufficient. Make sure that it is well ventilated. It is best to fertilise with compost and mulch with nettles and removed branches as well as leaves cut off from tomatoes. Continuously tie up the plants. Earthing up the soil all around, strengthens the plant. From early summer until early autumn (in central Europe that is from June until September) regularly thin out, removing all of the side shoots growing in the leaf axils. Removed side shoot can be used as cuttings. It is quite easy to whole new plants from them, which can even be harvested in the same season. Put the cutting into a glass of water and wait until the first small roots have formed. Then put them into the soil. Diseases: Early blight, bacterial stem rot and fruit rot, late blight. Late blight is caused by fungal spores in the soil beneath the plant. Remove affected leaves and tomatoes immediately and put in the domestic waste. Do not grow tomato plants too closely together. When watering, hold the watering can very close to the tomatoes. Remove the lower leaves and branches to a height of about 30 centimetres and prevent the tomato plant from touching the ground. Move to a new location if the previous year's tomatoes were diseased. Put a small empty flowerpot into the soil next to the plant so that the top edge of the pot just protrudes. The water can be carefully added to this. Wrap green tomatoes in paper and store them at 18 to 20°C. Placing an apple next to them can accelerate the ripening process. Cut off tomato plants at the bottom, remove the leaves and hang them upside down in a warm room. Tomatoes should be stored in the dark, well ventilated and not too cold, so that no pressure marks (bruises) arise. Do not keep tomatoes together with cucumbers of other vegetables or fruit. 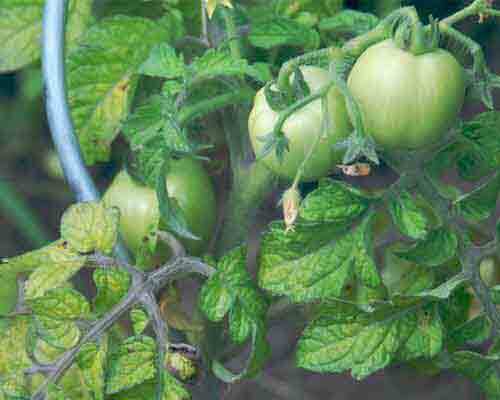 Fruit and vegetables kept next to tomatoes will ripen and spoil quicker. Cocktail tomatoes are suitable for fresh consumption in salads and sandwiches, and can be conserved in vinegar and oil. Plum tomatoes (e.g. Roma) are used for tomato sauce, ketchup, bruschetta and pizza. They are also very suitable for drying. Beef tomatoes are popular for grilling. One person consumes an average of 25 kg a year. Der Pro Kopf Tomaten Verbrauch liegt bei etwa 25 Kilo jährlich. Quellen: BLE; BMELV; DESTATIS; LfL Stand: 14.03.2013.